Egbert Bakker (PhD Leiden, 1988) is Professor of Classics at the University of Yale. He has taught at Yale since 2004. Before he held positions at the University of Texas at Austin and at Université de Montréal. He also taught at the University of Virginia and Leiden University. Within the field of Greek language and literature he is interested among other things in the linguistic side of poetic problems and on ways of literary communication in Archaic and Classical Greek literature. Egbert Bakker has written on oral poetry, poetic performance, the linguistic articulation of narrative, and the differences between speaking and writing. 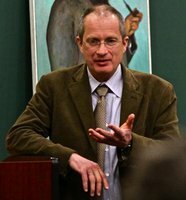 His recent books include Pointing at the Past: From Formula to Performance in Homeric Poetics (Harvard 2005); A Companion to the Ancient Greek Language (Malden 2010); and The Meaning of Meat and the Structure of the Odyssey (Cambridge 2013). Currently his main research project is a commentary of Book 9 of the Odyssey for the “Green and Yellow” series Greek and Roman Classics (Cambridge).